We set out to drive the 2014 Lexus GS 350 Sport Sedan with the formidable F SPORT package and came away with very favorable impressions. Lexus has moved the needle on styling in recent years and continues to challenge all rivals on the performance front. This car was up to that challenge! Behind its distinctive spindle grille, which creates an unmistakable brand identity, the Lexus GS 350 shines bright with a refined but aggressive body. You first notice the 19-inch alloy wheels that pop along the amazing Riviera red paint. The GS 350 F SPORT is exclusively equipped with 19-inch staggered width wheels paired with 235/40R19 front and 265/35R19 rear summer compound tires for RWD models, while AWD models will have 235/40/19 all-season tires in the front and rear. The F SPORT stands apart with exclusive front bumper and rear lower valence styling, a rear lip spoiler and F SPORT mesh grille inserts. The rear bumper integrates a distinctive exhaust diffuser and centered aero fins to help control underbody airflow. Even with its sweeping, coupe-like profile, the Lexus GS 350 provides ample headroom for rear-seat passengers. The new-generation GS offers greater rear headroom, knee room, legroom and foot space than the previous GS, yet in a sleeker package. The trunk, too, grew with the redesign and can easily accommodate four golf bags. The sumptuously detailed cabin, trimmed in perforated leather and matte dark brown walnut wood, comes with standard 10-way power front seats. Some competitors charge extra for leather, even in this price range. Rear seat passengers are treated no less regally, with deeply scalloped seats providing excellent support and generous legroom for long trips. Lexus recognizes that temperature is a personal preference, with passengers often having diverse needs. The GS 350 addresses this situation quite effectively. A first-in-class technology, the energy-saving S-Flow automatic climate control system detects if there is a front passenger and directs airflow only to the occupied front seat or seats. With the optional heated and ventilated front seats, the 2014 GS 350 gains the Climate Concierge feature similar to that in the Lexus LS flagship sedan. In the GS 350, the system automatically monitors the temperature of three separate climate zones and adjusts not only the fans, but also the temperature of the seats and steering wheel individually. Each zone will achieve its pre-set level of comfort as quickly as possible. The addition of the Siri Eyes Free function complements the user technology already in place in the GS 350. The next-generation Remote Touch with one-push confirmation is standard and enables smooth, intuitive control of climate, audio, phone, the optional navigation system and more. A standard rear back-up camera helps adds security and convenience. Located front and center, and central to that technology, a vibrant high-resolution control display provides easy access to a multitude of vehicle features. Equipping the GS 350 with the optional navigation system adds a stunning 12.3-inch multimedia display with split-screen capability. You can view a large map display on the left side while also monitoring audio, climate or other vehicle information on the right. The available 17-speaker Mark Levinson premium surround sound audio system has 7.1 channel surround sound through 10 channels using a new class D Digital amplifier with a clean 835 watts from 20 to 20,000hz at only 0.01 percent total harmonic distortion. Lexus offered just about anything one could imagine in our F Sport test GS 350 and the cabin is a home run! 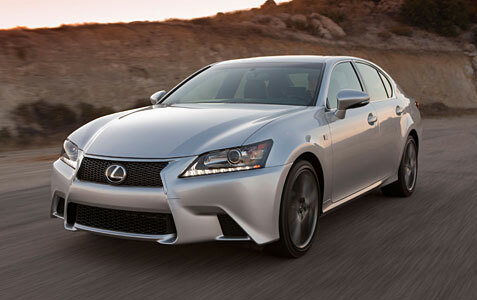 “Spectacular” is the best word to describe the drive of the 2014 Lexus GS 350 Sport Sedan F Sport. 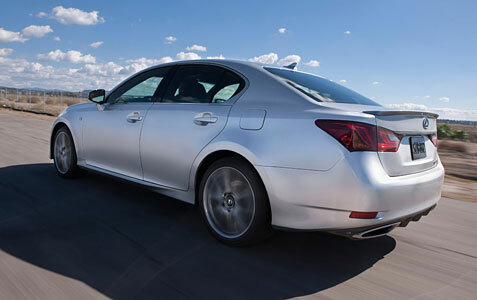 Leading a long list of enhancements for 2014, the GS 350 boasts a new eight-speed automatic transmission with steering wheel paddle shifters debuts for the rear-wheel drive (RWD) model, heightening performance response and improving fuel efficiency. Behind its distinctive spindle grille, which creates an unmistakable brand identity, the Lexus GS 350 delivers a powerful yet refined kick from a 306-horsepower 3.5-liter V6. The unique combination of both direct fuel injection and additional port fuel injectors ensures ample power and torque at all engine speeds. The dual exhaust tips emit a muted growl under acceleration and a hushed tone at cruising speeds. The F SPORT package as tested, which can be paired with either the RWD model or with the available all-weather drive (AWD) system, sharpens the handling aptitude and driver engagement without disrupting the renowned Lexus smoothness and refined demeanor. We spent most of our time in Sport S+ mode, which totally changes the driving experience. However, the GS 350 really comes alive in SPORT S mode, with throttle mapping delivering sharper response and transmission shifting priorities altered to hold gears longer under acceleration. Instrument meter lighting changes, appropriately, to red when driving in SPORT S mode and went further with Sport S+. The “plus” widens system engagement to also include a sport setting for the Adaptive Variable Suspension, electric power steering system and Vehicle Dynamic Integrated Management (VDIM). The result is the most engaging GS driving experience ever, yet still while maintaining the classic Lexus smoothness and comfort. Taking inspiration from the Lexus LFA supercar, the F SPORT Package for the GS 350 amps up handling with a comprehensive chassis makeover. The special sport-tuned suspension substitutes firmer springs, larger front brakes with high-friction brake pads, an Adaptive Variable Suspension damping system, thicker stabilizer bars, a variable gear ratio steering system and specially tuned bushings. Not surprisingly, the GS 350 F SPORT maintains outstanding ride composure even with its amplified handling acuity. On top of F SPORT, the GS 350 we tested was also equipped with the Lexus Dynamic Handling (LDH) system with Dynamic Rear Steering (DRS). When equipped, the rear-wheel steering can add up to two degrees of input, with the variable gear ratio steering system, also adding input at the front wheels for exceptionally controlled cornering performance. The F SPORT stands apart with exclusive front bumper and rear lower valence styling, a rear lip spoiler and F SPORT mesh grille inserts. The rear bumper integrates a distinctive exhaust diffuser and centered aero fins to help control underbody airflow. Exclusive F SPORT design touches continue in the cabin with smooth, striated aluminum trim, unique perforated leather upholstery and trim, a black headliner, aluminum pedals and a three-spoke F SPORT steering wheel. The 2014 Lexus GS 350 F SPORT Sedan can be just about anything the driver chooses and is one of the sweetest cars on the road to boot! Fuel efficiency was respectable coming in at 19mpg in the city and 29mpg in highway driving. But with those numbers, you have such an incredible ride that you appreciate every moment in this car. A luxury sports sedan comparable to the GS 350 F would normally cost close to six figures, but the model we tested stickered out at $61,155.